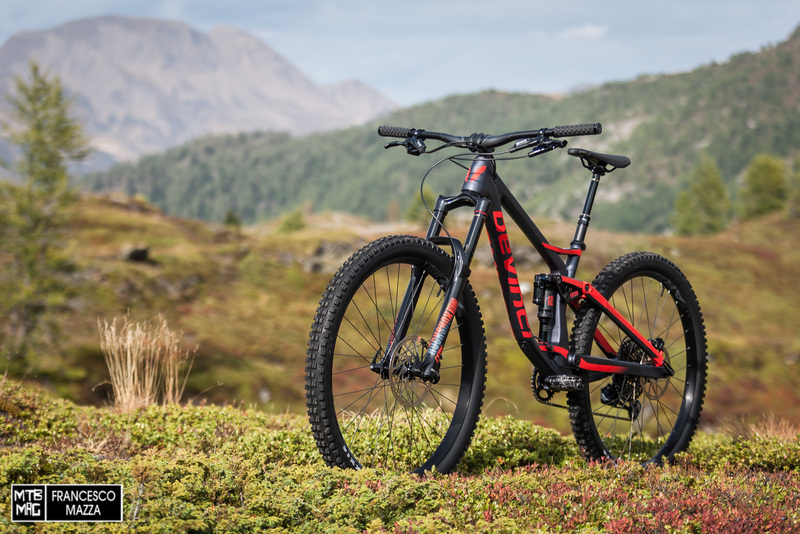 Devinci has launched a new version of the Spartan with 29″ wheels and they’ve also refined it with some new details that make it a more modern, aggressive enduro race weapon, ready to race on the toughest stages of the EWS or to challenge friends on the home trails. After several aluminum prototypes made last winter directly at the Canadian headquarters of Chicoutimi, followed by some prototypes in carbon, the Devinci testers, including Damien Oton, have approved of the final version of the Spartan Carbon 29 that will be raced this weekend at the final EWS in Finale Ligure and then released into the market starting in the next days. We received a copy of the GX Eagle version from Canada to test it for you. 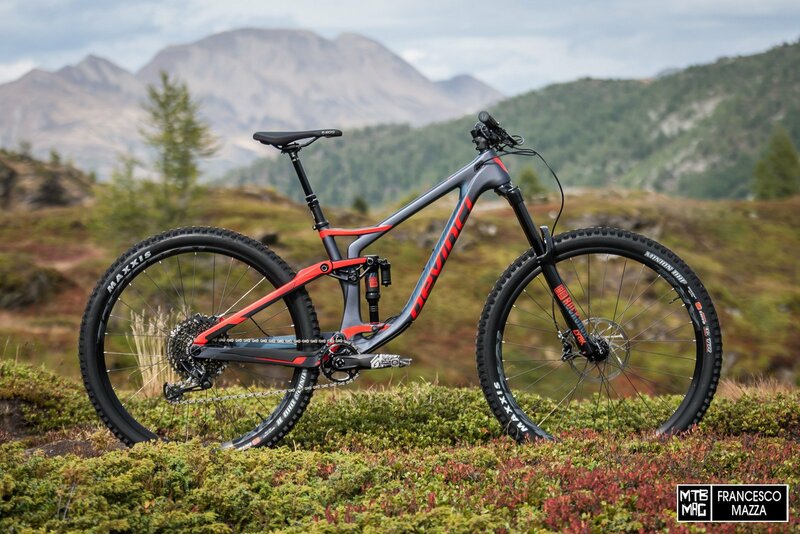 Except for the linkage that drives the rear shock, the entire frame is made of unidirectional carbon fiber with a proprietary technology, called Devinci Monocoque Carbon Gravity (DMC-G). This construction technique is based on molds with EPS cores, providing for special weaves of different types of carbon skins to obtain stiffness and / or strength according to the needs of the different points of the frame, while the resin is added with nanoparticles able to increase resistance while decreasing weight. The new Spartan 29 is also available with an Optimum G04 aluminum alloy frame. 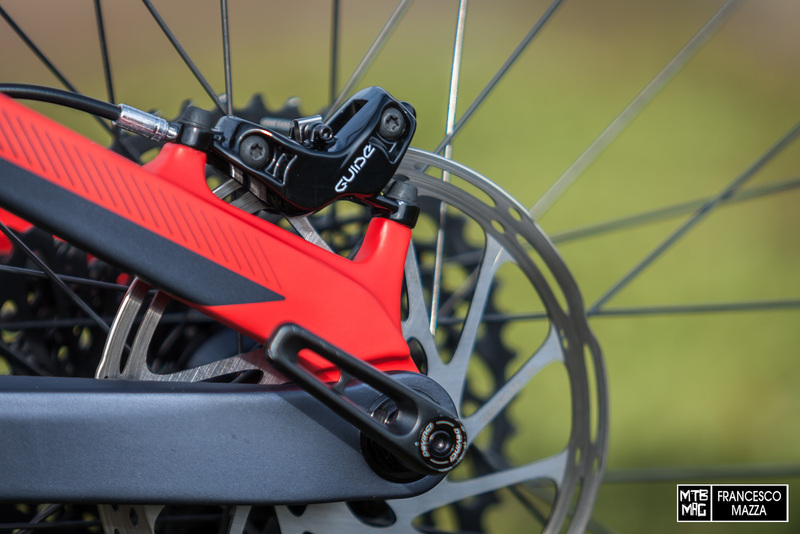 The suspension system is the Split Pivot patented by Dave Weagle, which is now Devinci’s trademark. 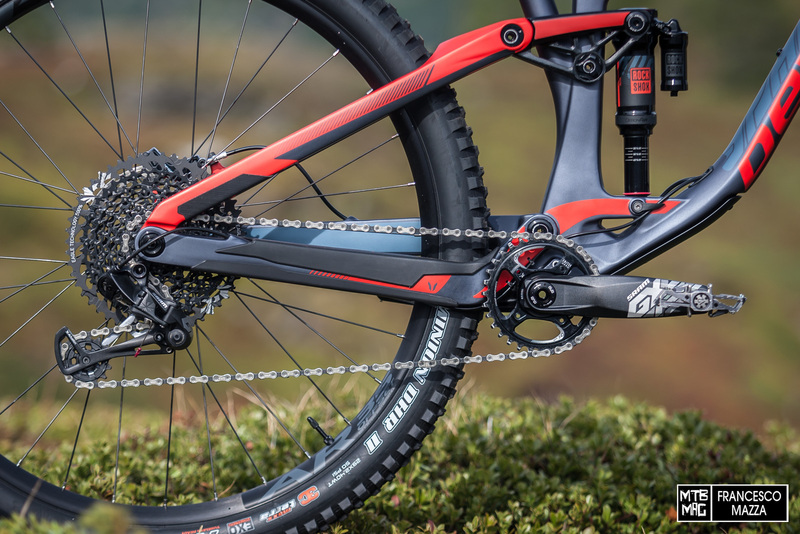 A good 165 millimeters of stroke is available at the Spartan 29’s rear wheel, managed by a metric shock with a trunnion-type mount, specifically a RockShox Super Deluxe RC3 DebonAir with a standard-installed Token. The compression damping in the “Pedal” position is not very identifiable, and stabilizes the suspension without significantly reducing the ability to absorb obstacles, providing considerable traction when facing climbs on bumpy ground, even particularly technical. In Firm position the damping is greater and the suspension becomes adequately stable for the mashing on fire road climbs, even when standing on the pedals, but continues to maintain a enough shock absorption capacity. The kinematics of the Spartan 29 has a compression curve that is also suitable for using coil spring rear shocks. 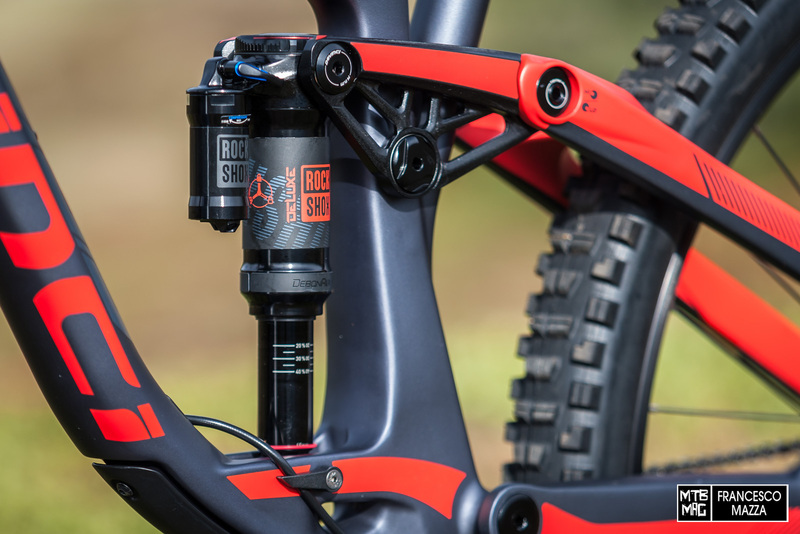 Devinci remains at home with RockShox handling all of the suspension needs on every set-up of the new Spartan 29, both in the Carbon version and in the aluminum alloy version. On the GX Eagle under test we find a DebonAir Lyrik RC with a 170mm travel Charger2 cartridge, with a Token installed standard inside. All versions include forks with 51mm offset except for the GX Eagle LTD version, which features a 42mm offset Lyrik. The operation of the new Lyrik, is supportive and very plush thanks to the DebonAir cartridge, and the Charger2 hydraulics respectively. Both are very well suited to the behavior of the rear suspension. The drivetrain is entirely SRAM GX Eagle 12-speed. The rear hub of the Spartan 29 is a 157mm SuperBoost, so to get the correct chain line, while waiting for SRAM to deliver their dedicated chainrings for SuperBoost, Devinci had had to resort to OneUp Components chainrings for this first round of fittings. The standard ring is 32 teeth, basically suitable for the use of the Spartan 29 which, however, for those who want more power, it accepts chainrings up to 38 teeth. The bottom bracket is of threaded DUB type. The cranks are 170mm in length, fortunately since the very low bottom bracket, combined with the long travel, means it’s easy to clip your pedals. If you want to use a chain guide, the frame is equipped with an ISCG connection. The wheels chosen by Devinci for this set-up are assembled with Novatec hubs, Boost front and SuperBoost rear, laced with 32 spokes for the RaceFace AR35 asymmetric rims, where 35 indicates the internal width of the channel. 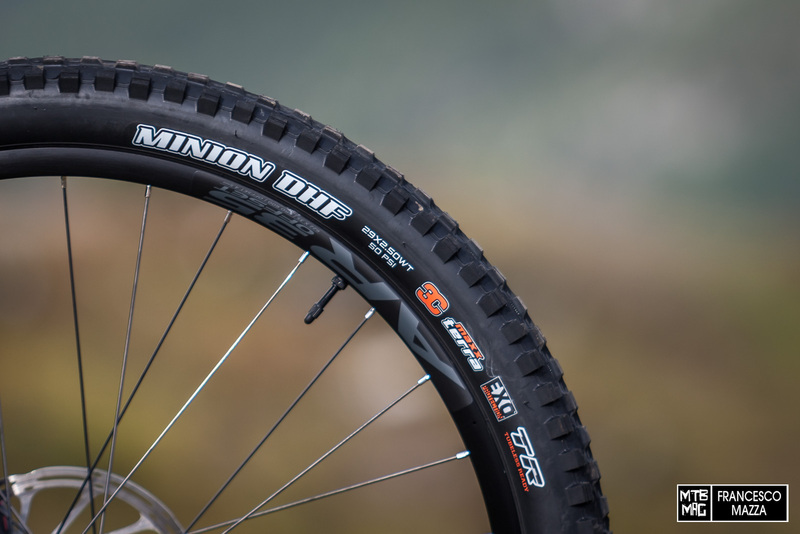 In conjunction with such a wide channel, we find the Wide Trail version of Maxxis’ Minion tires, specifically a 2.5 “DHF at the front and a 2.4” DHR II at the rear, both in 3C compound and with EXO casing. The wheels are provided with tape and valves to be used in Tubeless mode. The Spartan 29 wagon can accommodate tires up to 2.5 “wide. Stopping is left up to SRAM Guide R brakes with a 200mm Centerline rotor up front and a 180mm at the rear, where the mount is 180 post mount, direct. As usual for the Guide systems, this model also suffered from lengthening in the stroke and a slight fading but basically showed adequate power to the intended use, even if a better performing brake would be better matched with the excellent performance of the Spartan 29. One wonders when manufacturers will finally begin to give credit to brakes with impeccable performance like Formula Cura that unfortunately still do not find the space they deserve in the OEM market. 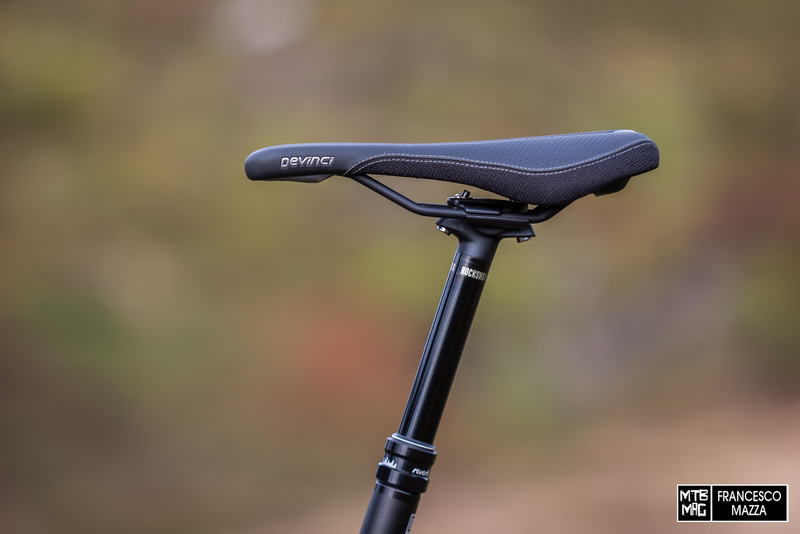 SDG has created a custom Fly Mountain saddle for Devinci. 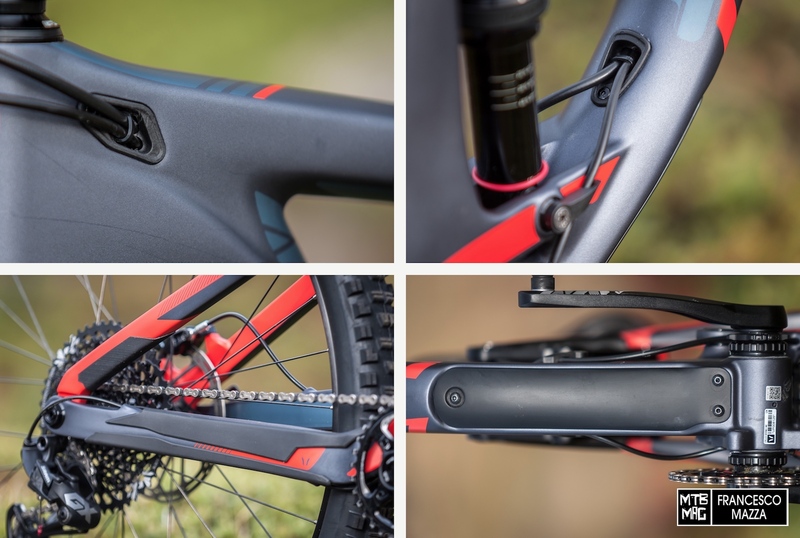 The seat post is a RockShox Reverb Stealth with a 1x remote control. The travel planned for size Medium is only 125mm despite the chassis having room in the seat tube, which is very low. In fact, in my case there would be plenty of room for a 150mm seat post, which is the maximum length compatible for the medium frame. The compatibility for size S is 125mm while for L and XL the compatibility extends up to 170mm models of travel. 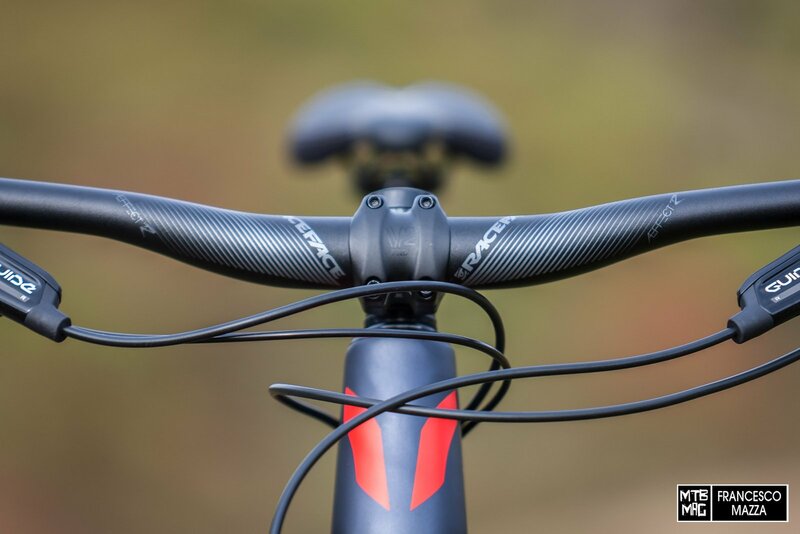 The cockpit features a V2 stem, the Devinci component brand, PRO model with a 35mm diameter and 50mm length. The handlebar is instead supplied by RaceFace with a 35mm diameter Aeffect R, 780mm wide and 20mm of rise. On the other hand, the two top-of-the-range outfits feature 800mm wide handlebars. The cable routing is completely inside the frame and the carriage. The cables are inserted in the steering area through specially made plastic doors screwed to the frame, equipped with cable ties to lock the cables in place. 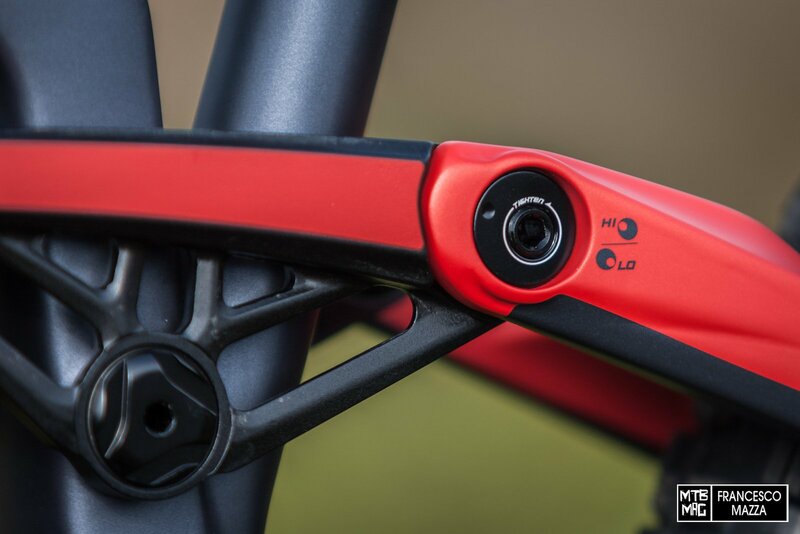 They come out in the lower part of the top of the down tube and continue towards the rear end with a passage guided by two plastic latches which are fixed by screws that thread into the lower shock hardware. From here they continue inside the rear end, which is protected from the chain thanks to a preformed hard rubber shell that completely wraps around the chainstay. The lower part of the down tube is protected by a carbon shell reinforced with Kevlar fibers which is fixed by 3 screws and incorporated into the frame design. The Spartan 29 offers the possibility of adjustable geometry between two positions through the classic flip chip that varies the head angle by about half a degree, and the bottom bracket height by almost a centimeter, which in the High position is on par compared to the majority of the enduro by 29 bikes from the competitors, while in the Low position it is really quite low. 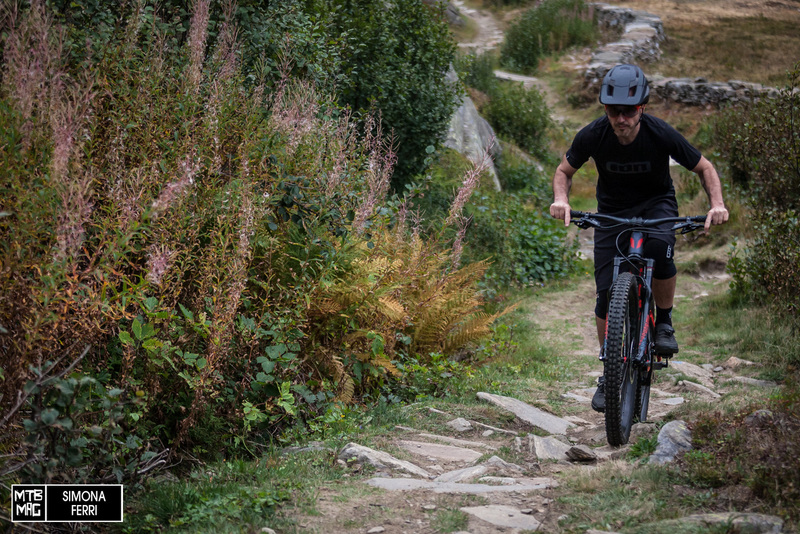 The taller BB height on Alpine trails, where you risk otherwise to clipping pedals very often on the rocks, is the only real advantage I found in the High position while I think that the Low position reflects more the decisive and aggressive character of the Spartan 29. 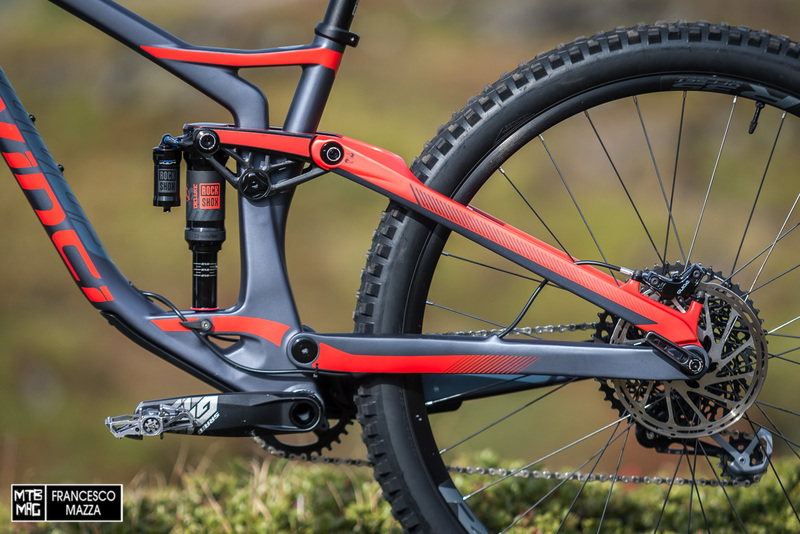 In general we find aggressive and well balanced numbers with a rather short chainstay, thanks to the adoption of the SuperBoost, a well-balanced steering angle and a very vertical saddle angle. The main purpose of the upright seat tube is obviously to make room for the 29-inch wheel with all 165mm of travel, but the side effect of the forward positioning was that in the downhills it adds some standover, but above all, on the uphills where there is excellent grip with highly efficient body weight distribution. The Spartan Carbon 29 tested in GX Eagle and size M, is just over 14kg and is clearly a very aggressive bike and devoted to the descending, however, on the long meandering climbs you can pedal without too much effort, thanks to the positioning that does not place the rider too vertically on the bike. 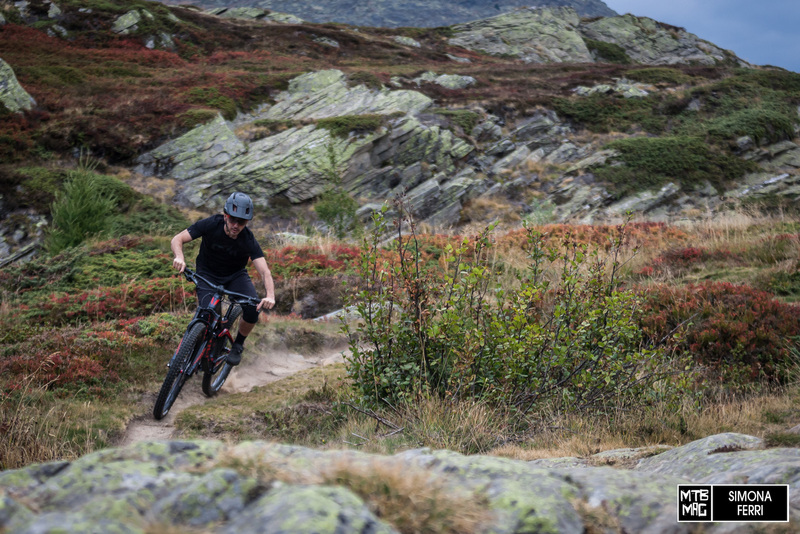 The smoothness of Novatec hubs is very good and overall you can also grind out a lot of difference in altitude without suffering too much from its downhill leanings. 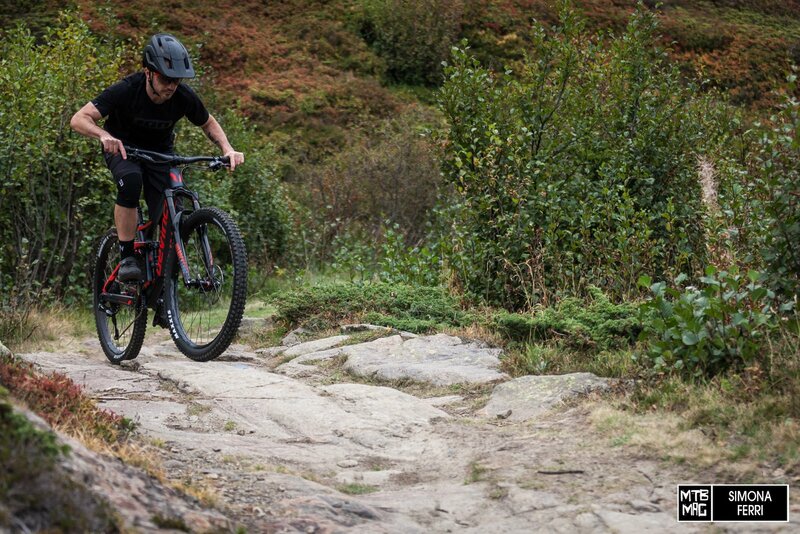 On technical climbs the bike devours obstacles and makes you forget the rather cumbersome geometric dimensions of an aggressive enduro, offering trail bike performance. The traction is impeccable and the forward position allows you to rely on the grip of the front end that is always precise and easily manoeuvrable, with no need to move to the tip of the saddle. 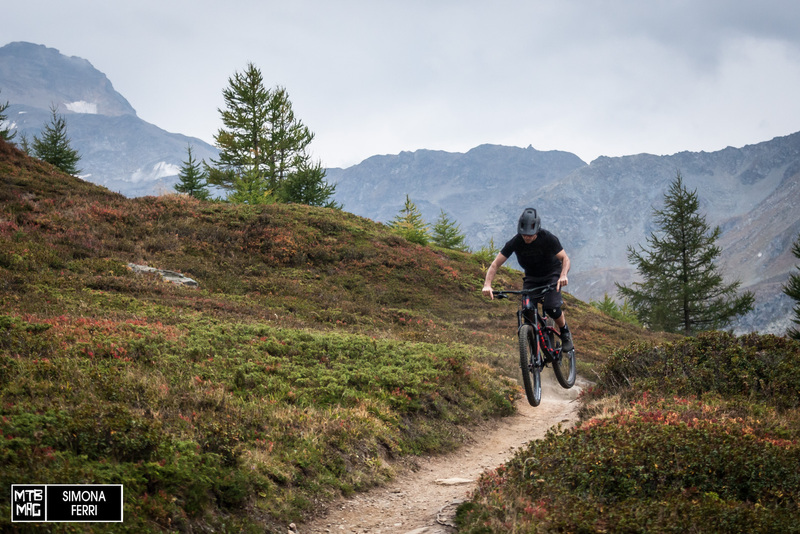 In the technical and in general on the punchy bits, you can pedal standing upright even without the bike diving or moving too much, on the contrary, it gives back power and speed, making it quick and agile. 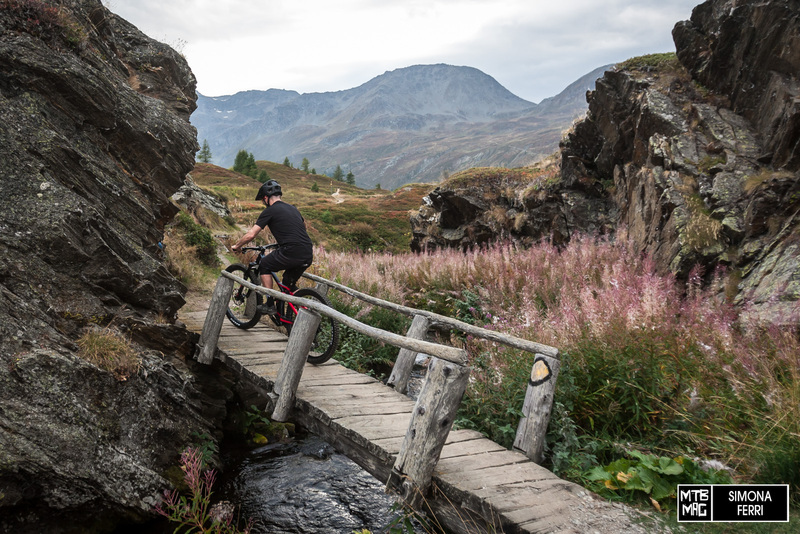 Just a few meters into the valley and you’ll become familiar with the Spartan 29, a bike created to devour the trail that makes you feel at ease and in full control even at high speeds … a condition that you get used to given the excellent downhill performance of the bike. Personally I found myself improving all the personal time on my trail of the house, in every single exit, while never feeling on the limit or anyway in “race mode” but simply having fun, a clear symptom of how much the Spartan 29 offers ample margin to the rider to improve its performance in absolutely safe manner. The riding position is central but allows you to move to the front or rear according to need without ever losing grip on the opposite wheel, for a feeling of stability and control that is really reassuring. The manageability is excellent, thanks to the low BB and in general to the very low center of gravity. Cornering is handled in a precise and stable way while the changes in direction are flawlessly quickly. An important role is played by the short rear end which helps to snap turns off in a decisive manner while the suspension always guarantees excellent grip and behavior to get you out of the corners in full control. In the fast and rough sections the stability is better than most, and the Spartan 29 always feels balanced with suspension that swallows both high speed chatter and the bigger hits without wallowing, ready to hit after hit, leaving the rider the only task of focusing on their trajectory. The very rigid frame is decisive for the precise handling in battered sections, and also ensures the suspension continues working optimally. The Super Deluxe never showed signs of fatigue suggesting that the excellent kinematics of the Spartan 29, with a damper of superior quality, can offer truly high level performance. 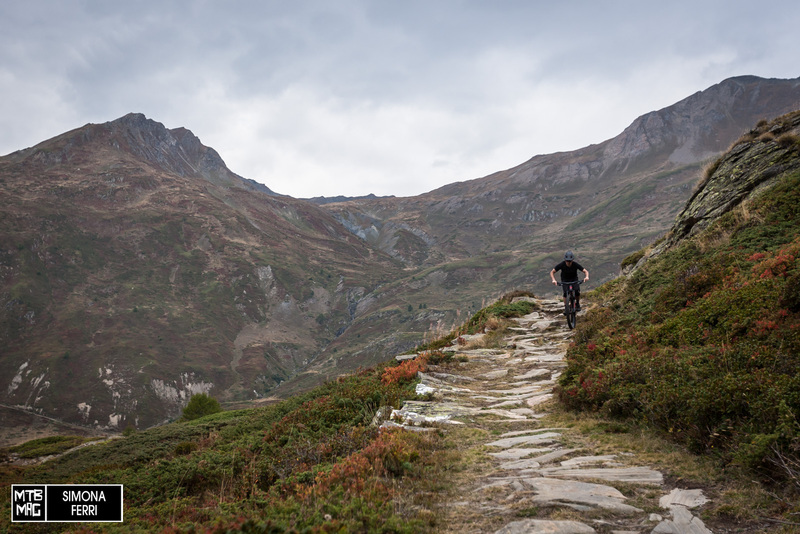 The handling in the technical bits is impeccable, both in extremely steep sections and in those mid-grade sections, where the to overcome obstacles, you have to work harder with your arms and legs. Balanced and precise, as well as intuitive, the Spartan 29 lets you keep the gaze on the turns ahead. 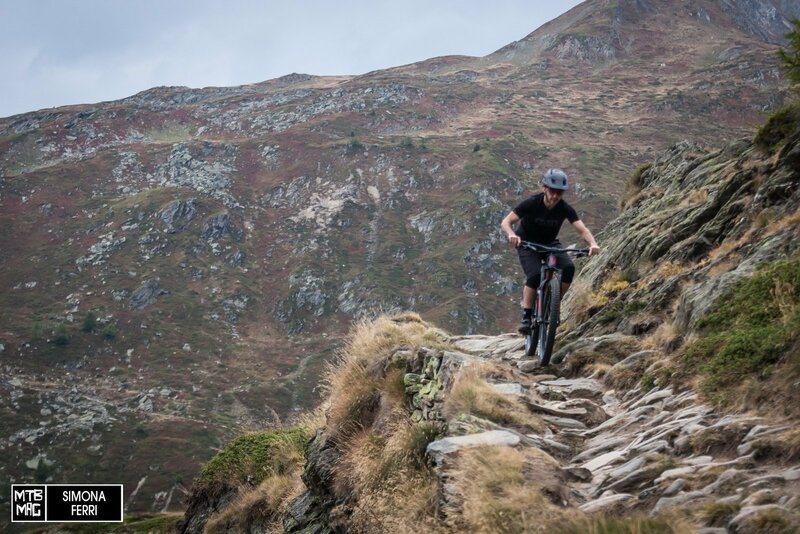 The supportive yet supple suspension operates nicely in the middle zone of its travel, and for this reason always leaves plenty of room for absorbing larger impacts, giving the sensation that you’re floating over obstacles. Devinci has created an enduro race weapon with such high performance that it will not be surprising if we will often see it on the podium at the EWS races. The Spartan 29 definitely worth being taken into consideration by those who compete but, it is also an excellent adventure companion for those who prefer a very aggressive bike for their big mountain rides which can give satisfaction both in technical and rough downhill sections while still getting you back up the hill. 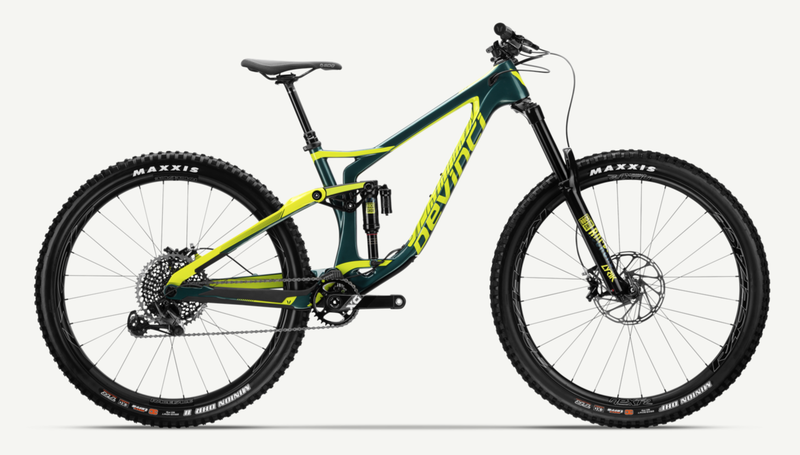 Devinci offers four versions and a frameset for the Carbon version of the Spartan 29, available in two colors, while for the aluminum alloy version, available in one color, there are two spec levels in addition to the frameset.